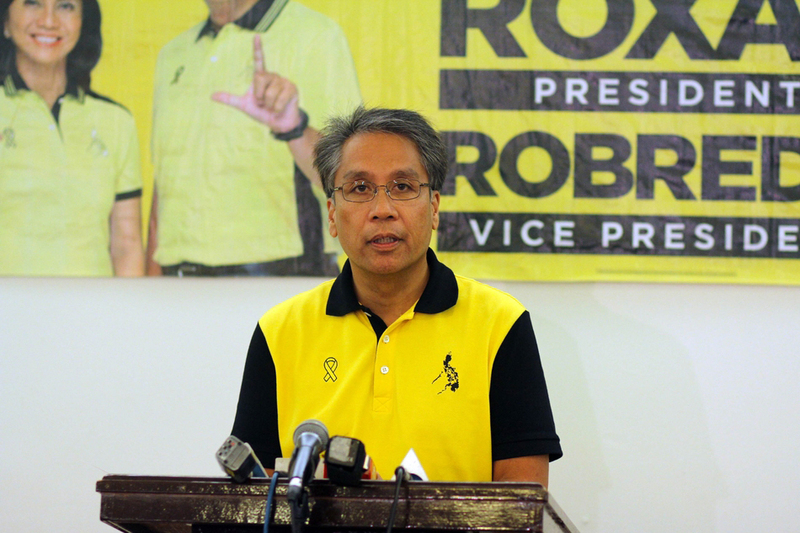 MANILA, Philippines- Liberal Party standard bearer Mar Roxas has raised the white flag in the 2016 presidential race on Tuesday, May 10 in front of his supporters in his campaign headquarters in Quezon City. Visibly emotional but calm, Roxas conceded defeat to the presumptive winner of the presidential election saying the results clearly point victory to Davao City Mayor Rodrigo Duterte. Although the two rivals had a series of heated exchange during the campaign period, he wished his toughest opponent success. Roxas was initially set to hold a media briefing at 11 a.m. but it was postponed at 1 p.m. after meeting with vice presidential frontrunner and running mate, Camarines Sur Rep. Leni Robredo. He also urged supporters and the public to continue monitoring the election results particularly in the vice presidential race where Robredo is engaged in a close fight with Sen. Bongbong Marcos. "Ngayon, hindi pa tapos ang laban ni Leni. Angat siya. Lumalaban siya. Patuloy tayong magbantay, manalig at sumuporta. Siguraduhin natin na mabibiling ng tama ang kanyang boto,” Roxas said. In what was dubbed as a supreme sacrifice, Roxas set aside his ambition of becoming the President of the country and gave way to Benigno Aquino III, who was a Senator then, in the 2010 National Elections. While Aquino won the 2010 presidency in a landslide victory, Roxas lost to then Makati City Mayor Jejomar Binay in the vice presidential race.